The Samyang 100mm T3.1 VDSLR ED UMC is a macro telephoto manual focus cine lens designed for full frame sensor sizes. This macro lens with vivid colour and soft out-focusing is the best lens for close-up images of flower and insects. 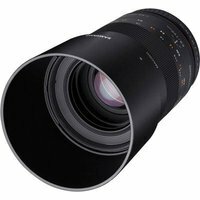 It also can be used as a 100mm telephoto lens for landscapes and portraits. The maximum close-up magnification is 1:1.